While dancing at a super hip party, you met this super cute guy (or girl) and it clicked between the two of you. However, you didn’t have any mobile phone plan in Germany and you couldn’t give your local number to stay in touch: bummer! You can’t even call home yet to tell all about your new adventures. Here is a little overview to get started. Very soon you will have to make a choice: do you want to choose a prepaid plan or a contract. If you are to stay for only a few months here, it might be wise to choose a prepaid one. 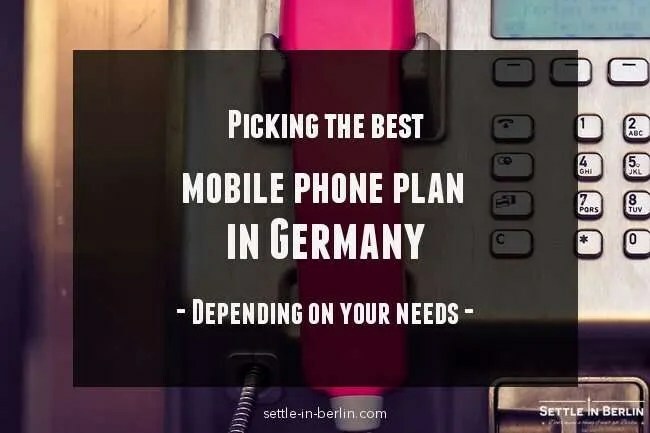 It surely brings less perks but after all, all you really need is a mobile phone plan for Germany with which you can be reached. Prepaid brings the basics like a phone number, calls and texts billed per min or per text. On the other hand, if you staying for more than a year and you need mobile internet as well, you’d better go for a normal contract. If you are staying even longer, you could even get a new phone with that. In all cases, in Germany, SIM cards are sold separately from the phone, so be sure to have your phone “unlocked” before you come here. Otherwise, you won’t be able to use it with a German mobile phone plan. Most of the SIM cards can be obtained in supermarkets, or local stores for around 10€. They come with no minimum costs and no minimum commitment. Most of them bill 9 cent per SMS and per minute. Have a look at tip 1 to compare all those plans. Please be aware for tourists, temporary visitors; a law from 2016 is now making it trickier for you to consider this option. It use to be enough to show your passport to get a sim card and prepaid plan but not anymore. You now need to provide a German address, with the means to prove that you indeed live there, typically via a “Meldebescheinigung”. That makes it quite impossible for most people to provide this. Bye bye the practical option! A way around this problem could be to get a prepaid plan in another more lenient EU country if you can (see here which ones), and use your pre-paid plan while being in Germany. This is possible to do because roaming charges between EU members have now be removed altogether. If you were good enough to go through your anmeldung and open a bank account before, you are then able to sign for a contract at one of the following German mobile phone contract providers. I have selected what I think is the fairest plan but feel to explore. Those providers often provide a 1 or 2 year contract so be careful when you make up your mind. You might get stuck in a unwanted contract. If you are unsure about what to pick, have a look at tip 1 to compare . What if I only want a SIM card? Please note that if you order and activate your sim card online, you will need to go through an identification process with a Meldebescheinigung and your passport before you can use it. Each provider has different ways but most of them can do that via connecting you to a special service dedicated to that via webcam, or via a post office. Tip 1: You might want to have a look at Preis24 for good deals. What this website is that they buy phones and mobile phone plans in bulk to all those providers to get a better price for you. It’s also a nice way to compare plans between providers. You can either choose a contract + phone bundle or a contract alone. They even have offers for pre-paid plans. DeinHandy is also a good alternative where you can also compare plans. You can also buy a second-hand phone for cheap from AsGoodAsNew.com or Rebuy.de which sell recent phones at really good rates, with a 30-months warranty on top. They are cheaper because they had minor defects and needed repair, but still works perfectly. Usually expect at least 30% rebate. Tip 3: For all our friends coming from the US out there : If you were wondering about 4G bands, your mobile phone plan in Germany and compatibility issues, don’t worry about it. Europe has the same standards across all countries so no provider is really making a selling point with this. They are all using the same frequencies. Some offer the choice between “E-Netz” & “D-Netz” quality in their offers. D-Netz is the older spectrum of frequencies that usually reach further than the E-Netz while E-Netz has the advantage of being able to support a lot more calls at the same time on a given area. Prefer D-Netz if you are travelling a lot or living at the countryside, prefer E-Netz if you live in crowded areas. Thank you for the greatguide! Do you happen to know anything about which providers offer cheap/flat rate calling from Germany to other EU countries? That isn’t covered as far as I know as part of the EU roaming rules. Hey Kevin. You will have to check with each provider. This is not very common. with o2, i have a plan with only 60min for free to calls outside of Germany. Hey! I have a question: I bought a prepaid Ortel Sim Card Smart World S for 9.99€/ month. My balance at the moment is 0.01€, I have internet and can make calls (even tho I couldn’t make calls some days ago), but I cannot send SMS still. Why is that? And what are the payment methods for mobile bill? Thank you! Hey Udona. Sorry, i don’t know much about Ortel’s system. My boyfriend is staying one month with me but he does not live in Germany. He doesn’t have any Anmeldung to proof his address. Can he use “any” address? Is he going to get any documents per mail? Why do people need to register a Pre-paid number? is that going to some weird database? Hey Esteban. If he is staying only one month, he is not considered a German resident so he doesn’t have to register. So yes, that is annoying to get a temporary number. What about Lycamobile as mentioned in the post? This is great post with useful tips! I will be relocating with my family and I wonder if there is such a thing called “Family Plan” for mobile contract in Germany. If there is something close to this, what are the providers and key differences? Hey Shan. You’d have to look for “Familientarife”. Telekom does pretty good ones i believe. Very good tips thank you. But can you explain me something? I’ve bought a mobile phone with Sim card at Media Markt, my limit of gigabyte is 8gb, I have already spent it and still the internet is doing good, do they add extra tariff in my contract or? I mean I should pay more in the end of the month? Hey Kladakis. It’s probably because you have 8GB of 4G speed, and 3G speed after that. i am iranian and i have bought a house in germany. i need a sim cart (contract) to use in iran because i dont stay in germany often. can you suggest me which operator cost is cheaper for me? Hey Abb. Maybe it’s best to use a prepaid card in this case? because i will be in germany each month and for along time. i am not tourist. I’m confused; you said before you don’t stay in German often. Which one is it? Prepaid are used by all kinds of people, and it’s not for tourists, since you need a German address to get one. I wasn’t able to get an appointment for the Anmeldung process until 4 weeks later. Although I was able to open a bank account with N26 and have my debiting information. Is it possible for me to obtain a cellphone/contract without my Anmeldebescheinigung? Hey Michael, it seems that it’s become a requirements for most or all operators nowadays yes. Hi there! Great post- but where can I buy a simply sim in person? I don’t want to order it online, I’d like to try and get it and install it in one day. Simply Tel is online only. Sorry Lina. Hey Glad. Yes, you can keep your phone number when changing providers. that’s not a problem. Hello. Thank you for these useful tips, I wanted to find out more about purchasing a sim card on contract with a smartphone. I have seen the term ‘1€ im Red L’ on the Vodafone website… what does this mean? At the moment the phone I want isn’t 1€ but it says at the top ‘1€ im Red L’… does this mean I can get it for 1€ or ..?? This is a very useful tips. However, I am still undecided for me as I plan to be in Germany only for 4 months for an exchange program. As it is quite hard to find suitable place with anmeldung, do you think I should stick with prepaid plan then? Is it hard to get the prepaid plan without anmeldung? Thanks in advance! Well, it used to be easy but it’s gotten harder since that new law, as mentioned in the post. Hi Dawn, Coverage doesn’t vary across regions or carriers in Germany. I think it would be better for her to unlock her current iphone and use it with a sim-only plan in Germany. Much cheaper all around. I’m moving to Berlin in October to study a full-year there. The thing is that I was looking for a mobile phone provider which can give me unlimited internet access (I do not care about plans with SMS or calls, I just wanted to have unlimited data). I’ve also looked for it on the other post about Internet connection but I’ve noticed that you only talk about plans with 1/2/3GB per month. Is there anything that approximates to what I’m looking for? Hey and how much do they cost montly? Which service would be cheaper? Thanks for the article btw. Hey Carol. You can look at the comparison portals if you want to compare plans. I’m moving to Berlin form Toronto, Canada. Does Germany offer plans that offer international sms messaging as well as cheaper international calls? I’d like to be able to send international sms messages and make a few calls to Canada using my local German cell phone… What’s the best way to go about that? Hi Abhijeet. They usually have fees grouped in zones… USA/Canada usually belong together in a more expensive group.From what i know, when plans do include it, it’s only calls to other EU countries. there are may Mobile Calling App Services like Teleluft to make cheap calls from your smartphone. Those are also prepaid based. Hi all! My girlfriend and myself moved to Munich a month and a half ago. She has her bank account already for more than a month. She earns 3,5 k EUR a month net and we were able to get internet, haftpflicht insurance and electricity contract on that bank account. However, trying to get a mobile phone contract, a SIM-only deal for up to 20 EUR a month, seems to be impossible. We tried mobilcom-debitel and klarmobil and both denied her due to credit rating issues, not specifying what kind of, however we guess it is because she doesn’t have a credit rating built up yet. My question is, how long does it take in Germany to build up a credit rating before you can get a phone contract? Or is there any other issues? Currently due to our short stay in Germany so far, no SEPA transfers were made yet out of her account. Hi Virenque. Hard to say as only SCHUFA controls that. A matter of weeks in my opinion. Thanks for the article. Just wondering if Lycamobile offers 4G connection? I will be in Berlin for two months, will Lycamobile still be the best option? If not what would you recommend? Hi Luke. Only 3G i believe. Do you know if there is such thing as a cooling off period in Germany? So in the UK, I’m pretty sure if you sign the contract, you still have 14 days or so to change your mind (usually/always without a penalty, I think). If so, would you happen to know what such a regulation is called in Germany? Hi Beccy, The keyword you are looking for is called “Widerrufsrecht”, which many contracts offer, often for a period of 2 weeks yes. Check the contract details. I am also very grateful for all information I found on your blog, it made my life in Berlin much easier. I am also looking at buying a Simply card. Can I only do the regestration on their own website? Well done for the exceptional work in the whole website. I can not properly describe how much this have helped me so far while trying to settle in Berlin. I have one question on this topic though. I want to make a phone contract(haven’t decided with which provider yet) but i know that i will leave Berlin next january.This means that its less than a year and as far as i saw the least duration for a contract is a year. What happens then?I mean can i terminate it earlier or so? Do i have to notify them before i leave or what? Hi Igli. If you stay less than a year, then i would recommend a pre-paid plan if i were you. Hi, I will be studying in Germany soon and I know what I need a german phone number to open a bank account. Hi, yes, you can get a local nnumber with a pre-paid card. For the Simply Sim only, do I need to have the Anmeldung or a German bank account? Yes, a german bank account. Do you know if N26 is enough for a German bank account? I just got denied a Simply SIM card and I really don’t know why. I just got here so maybe it’s because I don’t have a Schufa, but they don’t talk about it in the website. Hi Zach. I don’t think N26 is the issue here. Thank you for the very informative blog! I will be living in Berlin for 8 months probably. I need to have some calls/text/internet (2-3GB). Since I will be here for 8 months and I already have my own phone I want a contract that is SIM only and goes per month. You recommend Simply, which looks really good to me. My question is: how is their network and coverage? I guess it will be fine in Berlin, but do you know how it is in other places in Germany? And in other countries in Europe with the free roaming? Hallo, I just arrived Hamburg by 31/10/2017, and the sales person(in Hamburg Airport) recommended me Lycamobile, with unlimited call and 5GB data usage with 40 Euro first buy and top up with 20 Euro monthly after this. I just check the rate today, I found that Lycamobile with my plan first buy only cost 9.99 Euro! I think I was cheated in the Hamburg Airport? However, Lycamobile did a good job. I have used google map go all over my small town to find a room, and the line is really fluent and smooth. Because I need to travel to other Europe countries sometimes for my studies or travel. Do you think Lycamobile still is the best for my current circumstances? P/S: I had always get lost and might need google map to bring me to all destination mostly. Thank you very much! and thank you for writing this website and I suppose red this early! Hi Tee, if you plan to move a lot Lycamobile is a great and flexible option. You pay a little bit more for the flexibility but it might be worth it in your case. I just moved to Germany and urgently needed a number so I took up O2 prepaid with 1GB. However, I need more data because I need to call Home frequently. How to I add on data because the website is in German and I am not able to find such info. Can I convert my prepaid number to contract ? Hi Rubita. I can’t provide customer support for o2, try to google translate the website. I am new here in Stuttgart and found the same issue with O2 with very low data capacity. Apart of all the details you have provided, Can you also write something regarding Phone exchange policy as if somebody is holding a new version of phone and want to get the latest one. Is that a easy thing to do here in Germany to have some exchange policy or offers ? Hi Junaid. You can sign-up for special contracts allowing you to receive a new phone every year or so. Exchanges per say, i have never heard of it in Germany. I landed in Berlin yesterday and have been trying to get a prepaid sim card from Vodafone & 3 locations that I tried said that they will not sell to anyone without German address. Does O2 have the same issues in store or will I be able to purchase with my passport for ID? Hi Steve, it will be the same issue with o2 yes. Have you had a look at Lycamobile? Hello, I am arriving to Berlin soon.. I want to buy a sim card sim card immediately after I land. are there any shops I can get the Simply sim card? Yes, any o2 shops or any supermarkets mentioned in the post. in monthly installments along with the connection plan right after I come there ? Hi Krishna. Buying a mobile phone with monthly installments will require you to have a good SCHUFA score, otherwise the operator will refuse your request. Find a cheap phone or find an offer with a one-off fee for the phone. If, like me, you’re in Germany for a short term, I wanted to share a solution that’s working well for me. With O2, after you use all your data, they only throttle you to 1 Mb/s, which is much faster than the 28 Kb/s offered by other providers, and honestly fast enough for everyday use. If 1MB/s sounds fast enough for you, you can get the O2 Free S on a monthly basis for €5 more, so a total of €25/month. This means you get 1GB of data at LTE speeds, and then infinite data at 1 Mb/s for only €25/month, with the ability to cancel any time. Hello, I’ll be in Berlin for two weeks for work, and I need a prepaid SIM to be able to make and receive calls as well as some surfing (like to this very helpful site). Any suggestions? Hi Claudia, any of the suggestions in the article work. Lyca mobile is also a good suggestion in your situation. This is very helpful. But I have an interesting case. I will be in Germany for a year and I use a lot of data, and might make calls to the US. For these reasons I was looking at a contract. But I simply can’t find a contract that isn’t 24 months long. What can I do? If I can’t get a contract what month-to-month plan do you recommend? Thank you! Hi Grace. As mentioned in the post, a contract won’t work for you. You might want to go for prepaid or alternatively, go for Preis24 and compare month-to-month plans to be sure to get the best deals. I’ve been looking at prepaid. The most GB I can find is 4. Am I looking in the wrong places? Prepaid plans are limited but you can buy additional data if needed. I assume you will not only use a cell phone but also a laptop or tablet? Or do you want to use solely your cell phone? You could sign a 24 Months contract with a major provider like Telekom or Vodafone. According to my knowledge if people are relocating abroad they can cancel their 24 Months contract (Sonderkündigungsrecht) giving 3 Months notice https://www.toytowngermany.com/forum/topic/33510-ending-a-deutsche-telekom-contract/. Send registered letter! Telekom offers a phone flat rate for Europe, the US, Canada and Mexiko for 3.90 Euro/Months extra. So you could call the US from home (landline simply buy a cheap phone) and talk as long as you want and use your internet connection with unlimited data at home. I pay around 42 Euro/Month. Included in the 42 Euro is the unlimited data for internet (fast connection), the modem, a landline (flat rate for German landlines) and the international flat rate region one (as described above). Call my friends in the US all the time, even their cell phones, never paid an extra fee. If you intend to stream tv shows etc. this would be the best option as it is fast and reliable. If this is not an option, you can ask your friends and family in the US to download the Whats app app to their smart phones. Here you can send messages, pictures, videos and even call for free when connected to wifi. I’m a youtube vlogger who will be trying to upload videos daily. I will be touring Germany for 9 months, before settling in Berlin. Obviously, internet (lots) and uploading bandwith/limits are very important to me. Can you give any advice please? Hi Ben. If you are going to settle in Berlin after your tour anyway; i’d advise you to register right away with at the Bürgeramt (if you can) to sign up for unlimited plans (with 1&1 for example), which unfortunately often comes with a contract only. Otherwise, take a prepaid sim card for normal use and upload your videos at night, whenever you have wifi. What’s your YouTube channel out of curiosity? I am planning to be in Berlin for 3 months, looking for a phone plan which will allow me to also use GPS (google maps) and have internet connectivity for social media. do any of the prepaid plans have that? Hi Shelach. Yes, most of pre-paid plans have data included in them, which allows you to have Google Maps and Social Media. I have had exceptionally bad experiences with mobilcom. I took mobilcom as a mobile carrier in 2012. Ater two years I started having serious problems with connection. Now that I recall, I dont know if the internet ever worked properly. Hello, I am moving to Ravensburg in about a month for work and I’m having trouble deciding on what company to get a sim from. I will live there for 18 months and would like a plan that gives me somewhere around 10 gigs of data a month. Currently I’m looking at a 2 year plan from either Deutsche Telekom or O2 or a monthly plan from SimplyTel. I would prefer to go with a month to month service provider as I won’t be there for the full two years. SimplyTel seems to be significantly cheaper but I have no idea what their service is like (the cost is not super important). I also plan on doing a fair bit of traveling during my time there Do you have any advice for which provider I should choose? Thank you in advance. Hi Nico. In terms of network access, all companies are riding the same radio waves so quality is consistent across all providers. I have no particular tip for you; you know best what your needs are. Hi Matteus. 1) Most common smartphones can be used on European bands with no issues at all. When in doubt, ask a seller in the shop. If you only need GPS and weather forecasts function, you won’t need a high end phone. I’d recommend a Motorola G4 2016 or even a Motorola E3 (2016). The vast majority of plans include also internet access, as well a normal phone service. There are really no cheap plans to make calls to the US. You would need to commit to a yearly contract to have this option cheap. I would however recommended Lycamobile in your case with their International Bundles which includes free minutes to call the USA, normal phone service and internet service as well. Good luck. After you cell pone contract is up do they have to unlock your phone? I have a 2 year contract that is ending in April 2017 with mobilcom-debitel. I gave them more then 90 days notice, but i also asked to have the phone unlocked and they said i need to call them. I would like to skip the sales pitch if possible, but i would also like to sell the phone when the contract is done. Hi Douglas. I assume your contract is a standard phone + plan type contract. In this case, the phone will be yours at the end of the contract and you have every right to have it unlocked. You will need to enter a long series of numbers and characters to unlock it. They will give you that so that’s probably why they want you to call. Just be persistent. I went for ALDI and it was cumbersome to set it up, especially since there is no in-person customer service and the phone customer service wait is interminable. You have to do so much more in setting up the account that I’ve never had to deal with before. Do one thing, wait for an email or SMS to confirm it and then go onto another step. Then at the end of the month when I needed to pay for the next month, I could not. You need a German bank account to do the payment. They do not accept debit or credit cards or bank transfer from a foreign account. I wrote to Aldi asking about using a foreign bank account and they never replied. Although they stated they would answer within 48 hours…it’s been a week. I assume this is the rule with all prepaid cards or even contracts? You must pay with a German bank account or the dreaded EC card! Germany needs to get with the program and accept any and all MasterCards and VISAs, credit or debit cards. Hi Ron. Thanks for the feedback. There was probably a mix up, you don’t need any bank account for prepaid cards, you buy credit at an Aldi supermarket or online. This is the case for all basic prepaid cards. If you go for any other plan with a contract (e.g with Aldi; Paket 300), you will need to have a German bank account indeed. That’s why i recommend the prepaid option if you haven’t opened one yet. Is the paket 300 not prepaid? I am thinking of getting an Aldi microSIM and either the Paket 300 or 600, which I understand can be paid for online with the credits on the microSIM added at an Aldi store. Is this not true, and if this is not true, does this basically mean any money on the card can only be used on a per SMS/minute/MB rate? My wife and I are going to be in Berlin in June for a month. I am going for work initiallyfor a few days but we are going to extend our stay to have a holiday. It seems we will not be able to buy a SIM at all- correct? Roaming is an alternative, but is quite expensive. Your advice will be appreciated. Hi Fred. It might be less hassle to book an international plan from your home provider. In your case, the most convenient option could be to go for a prepaid SIM option with no commitment so have a look at the prepaid plans options i have listed. Compare what would be the cheapest. good luck. Go for an operator named Lebara with prepaid plan. You can activate FLEXI XL plan which gives you 500 minutes of calling which includes both local and international in addition to 1 GB of 3G data. Thank you! Very good tips!